It is a non-invasive method to measure blood pressure by measuring the pressure oscillation size which is dected by a pressure sensor. This pressure oscillation is formed on the cuff above the artery when air pressure is applied to the cuff and is slowly removed. 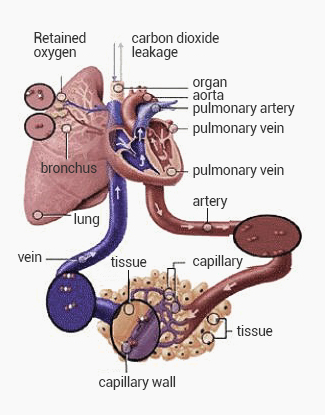 It is referred to the pressure exerted to the wall of the blood vessel when the blood that is pumped out from the heart flows into the blood vessel. It is widely used as an accurate, economical and easy-to-use measurement method. The importance on checking on various types of hypertension for a correct diagnosis. The importance of the difference value of the two arms’ blood pressures in helping the diagnosis of cardiovascular related diseases. Blood pressure is referred to the pressure exerted to the wall of the blood vessel when the blood that is pumped out from the heart, flows into the blood vessel. The blood pressure exerted to the wall of blood vessel when the heart contracts and pumps out indicates the highest blood pressure value. The blood pressure when theheart is full with blood, indicates the lowest blood pressure value. Digital blood pressure monitor measures blood pressure via oscillometric. It is a method to measure blood pressure by measuring the pressure oscillation size which is dected by a pressure sensor. This pressure oscillation is formed on the cuff above the artery when air pressure is applied to the cuff and is slowly removed. Everyone can use it easily without anybody’s help as the user can run the machine by a single botton, and the result is displayed in numbers. Mercury blood pressure monitor is the most traditional device which measures the blood pressure via the Korotkoff sound. It is a measuring device that reads the blood pressure by measuring mercury height of the starting point and the vanishing point of the pulse. This is done by exerting pressure on the measuring site by injecting air into the bulb, detecting the pulses by hand or stethoscope while slowly removing the air. 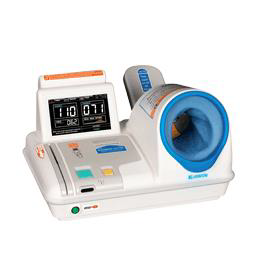 It is recognized as a standard blood pressure monitor since its structure is simple and there is less room for error. Digital blood pressure monitor is widely used due to the easy and convenient nature which can be used by anyone. In the United States and Europe, the use of mercury sphygmomanometer is gradually decreasing due to the concerns on environmental problems, such as mercury poisoning. 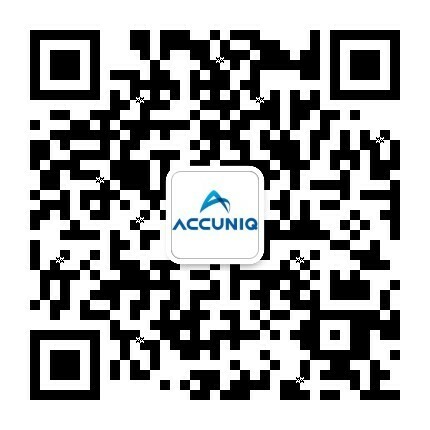 Digital blood pressure monitor of ACCUNIQ is accurate and economical, and provides voice-guided programs for senior citizens to easily check the blood pressure results. There are several types of hypertension, and blood pressure changes depending on the physical activity, posture, breathing, mental activity, duration of the monitoring and etc. For an accurate diagnosis, various types of hypertension need to be reflected. 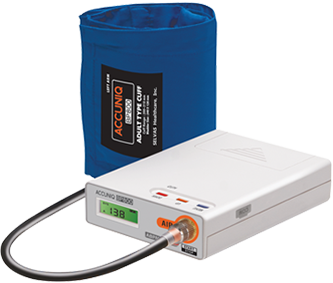 ACCUNIQ ambulatory blood pressure monitor increases the accuracy of diagnosis via the 24-hour monitoring which include sleeping time as well. 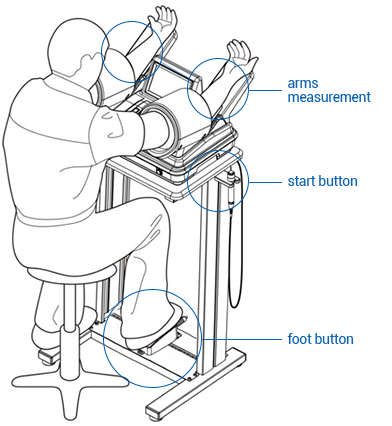 This 24-hour monitoring could be done due to its ergonomic design and quiet measurement. When you measure the blood pressure at home, it shows that it is normal, yet when you measure in a clinic, it shows that the blood pressure is high. When the blood pressure in a clinic is above 140 / 90mmHg and that of outside a clinic is below 135/85mmHg, it is considered as white coat hypertension. In general, a person usually has Dipper which the night blood pressure is 10-20% lower than the day blood pressure. However, it is called non-dipper if the night blood pressure does not fall or it is lower than the day blood pressure by less than 10%. It is when the blood pressure measured in the clinic is considered normal, yet the blood pressure increases outside the clinic due to the lifestyle such as alcohol/smoking/caffeine. How does measuring the blood pressure of both arms at the same time help in giving accurate diagnosis? Double Arm Blood Pressure Monitor not only does a basic measuring of blood pressure but it is also adiagnostic equipment that helps in cardiovascular disease related diagnosis by calculating the difference value after measuring the blood pressure of both arms at the same time. WHO recommends the patient to have a consultation with a doctor when the difference value between two arms measuring in the same condition is above 20mmHg for systolic blood pressure or 10mmHg for diastolic blood pressure since there is a risk of circulatory system disease. Please follow the instructions below for the safe use of the machine. Start measuring after placing your arm correctly. Don’t speak or move while doing measuring. Relax for 5 minutes before measuring. If the pressure of cuff is too high, please press I/O botton for the rapid removal of pressure. Please do not cross your legs during measuring Please stay in a correct posture, and do not measure on a low desk. Please remeasure after 3~5 mintues. Please measure in room temperature as cold increases the blood pressure. Please do not drink coffee or smoke before measuring. Please measure under the same condition every day. Please make sure that the clothes are not tight on your arm during measuring. Lack of sleep or constipation can increase the blood pressure. Please take off bulky clothes and wear the cuff on your bare skin if possible. We provide an immediate response to customer inquiries and simple theoretical explanation. 02 What is pressure rate product? Pressure Rate Product (PRP) is the value when systolic blood pressure is multipled to the pulse rate. Higher the systolic blood pressure and faster the pulse, higher the value of PRP. It is to evaluate how much pressure and exhaustion the heart is experiencing, and 7000 ~ 12000 is the normal range. Like hypertensive patients, if the pulse rate is very fast together with a high systolic blood pressure, there is an extremely high pressure on the heart and blood vessel which is very risky. 01 The value of blood pressure changes every time it measured. Our bodies are constantly changing. In addition, blood pressure constantly changes depending on the heart rate, respiratory cycle and etc. Since one-time measuring does not give an accurate blood pressure, ambulatory blood pressure is widely used recently as it can monitor the blood pressure for 24 hours. To make sure you measured accurately, please refer to the instructions for BPM on our website.